Islamic Jihad slammed Israel after photos were published showing armed Turks standing by Islamic Jihad members. "The occupation took advantage of the souvenir photos that were published on websites as filthy Israeli propaganda against the solidarity activists, to defeat their attempts to break the blockade (on Gaza)," said Islamic Jihad official Daoud Shihab to Palestinian news agency Maan. Shihab emphasized that the various factions of the resistance "are determined to preserve the lives of these activists." The aim of the factions, he said, was to get the activists out of the Gaza Strip back to their own countries unharmed, therefore they are "keeping them away from all danger." The activists in the photos took part in the "Peace Flotilla" which anchored in Al-Arish port in Egypt, and entered the Strip via the Rafah crossing. Pictures from their visit were posted on the Al-Quds Brigades site but were soon removed. During their time in the Strip, the Turkish guests visited some Islamic Jihad posts. Shihab praised the Turkish activists and noted they acted from "natural human desire to identify with the besieged Palestinian nation, which suffers death, annihilation and abuse at the hands of the Israeli occupation which kills children, abuses prisoners and makes life miserable for citizens." He added that the activists' solidarity visit aimed to "express identification with the besieged, with the rights of Palestinians and with the resistance." Another response from the Palestinian factions, also published by Maan, said this was "organized Israeli propaganda against the solidarity activists." The photos were published, it said, as part of the war Israel is waging against the aid trucks – "a war which began with the killing of American activist Rachel Corrie and continued to the killing of the activists on the Freedom Flotilla a few months ago." 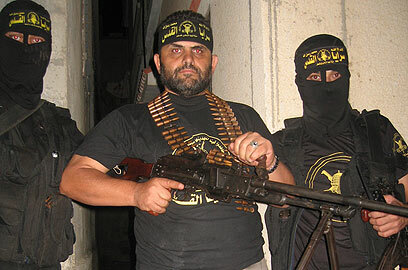 The Maan news agency published a summary of reports in the Israeli press and one of the photos released on the site in which the Turks are seen armed and wearing the uniforms of the military wing of Islamic Jihad. The caption said Israel is exploiting the publication of the photos of the Turkish activists while Islamic Jihad said they were photos for souvenir purposes only. See all talkbacks "Islamic Jihad: Israel exploited photos "